We celebrated too soon about Harrison’s arm. He broke his radial head (end of the forearm bone near elbow) in June. We were worried that the lack of circulation to the broken end of bone would stop it healing. A nuclear scan led us to beleive that the bone had good circulation, but it was wrong. A later MRI scan showed that there was no blood getting to the broken bit of bone. That’s why it didn’t heal. So after more than 6 weeks, Harrison’s broken bone hasn’t joined back up. MRI’s have a much higher resolution, so it was much easier to see what was going on after Harrison had the MRI. 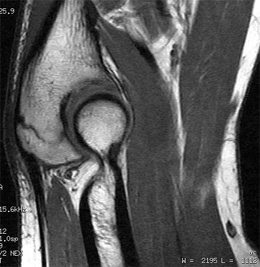 The attached image is a sample MRI of an elbow joint. It’s not Harrison’s elbow, because the hospital doesn’t give out MRI’s but it gives you an idea of the much better resolution that’s available. Since the bone isn’t healing, our doctor has recommended a bone graft. They’re going to take a small amount of bone from Harrison’s pelvis, put it into the break in his arm, and wire it together. The scarey thing is that they’re going to give him a drug called Pamidronate. It slows down the natural breakdown of the bones. In most of us, our bones are in a state of equilibrium – bone cells get created while others get broken down. When you take Pamidronate, your bone cells don’t break down. They just keep growing. There can be some nasty side effects like Kidney failure, seizures, breathing problems etc. But if it works, it will encourage the bone graft to take, and hopefully heal Harrison’s elbow. Because of the seriousness of the drug, Harrison will have to go into Hospital for a full day of tests every month while they he’s receiving the drug. This is hard work for all of us. But it will be worth it if Harrison’s arm heals. The alternative for a growing seven year old isn’t very nice. The bit of bone that broke is a “growth plate”. It’s where his forearm bone would normally grow from over the next decade. This won’t happen if that bit of bone dies, and he’d need an artificial “spacer” to replace the dead bit of non-growing bone. Lets hope it all works out ok!